When it comes to Walt Disney World, the thing that really impresses upon me the most is the memories that my family creates each and every trip. I wanted to take the time this month to share with you the memories that are most special to me. I hope you enjoy my trip down memory lane! As most of you know, I am the creator of the Disney fan blog “My Dreams of Disney.” As such, many of the memories that I’ve had on our trips have been told there as well, such as in the post “Why we go to Disney World”, that I published back on February 10th, 2011, and also in my post “What Makes Disney, Disney”, published on September 20th, 2010. Favorite Memory #1, Steph and Shane at Cinderella Castle. Last June we were fortunate to be able to take several close friends and family with us to stay at Kidani Village at Animal Kingdom Lodge. While we were there, although my niece Stephanie didn’t know, a plot was underfoot. Shane was going to propose to Stephanie in front of Cinderella Castle, and Cindy and I were asked to be present during the event. It had been pouring rain all afternoon and evening, monsoon type rain, but the rain let up around 10PM, and since the Magic Kingdom was open late, we went on to the park. As we got there, Shane made on that he wanted to get a few pictures of all of us in front of the Castle, and after we had a picture or two, all of a sudden Shane got down on one knee, and proposed to Stephanie! It was the most incredible moment I have ever experienced at Walt Disney World in my life, and I was honored that Shane thought enough of us to include us in their big moment. 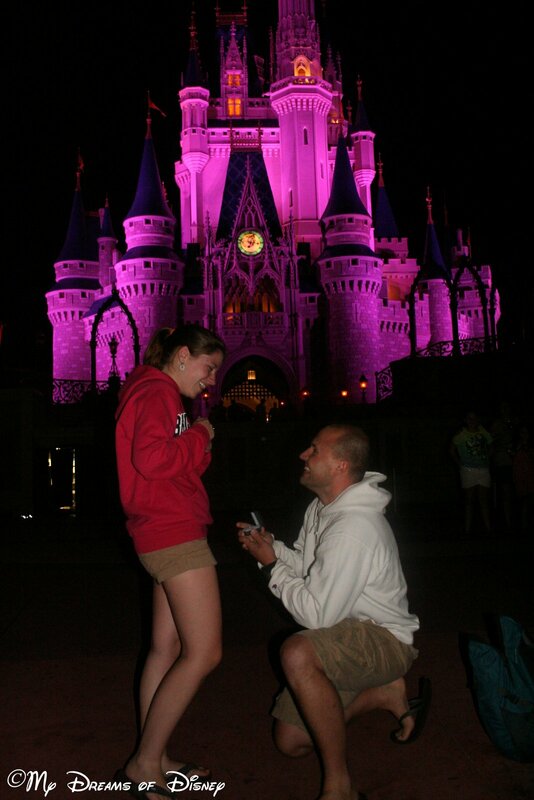 Of course my niece said yes, and then we all laughed and cried in the Magic Kingdom. For more about this moment, you can check out the post I wrote about it over at My Dreams of Disney. Favorite Memory #2, Watching Wishes from inside Cinderella Castle! Wednesday, June 13, 2012. Probably the busiest day of our vacation — in the early afternoon we had a Bibbidi Bobbidi Boutique appointment to keep for Sophie, Madelyne-Lois, and River, while Moms Cindy, Monica, and Kerry ended up getting their own partial makeover also (and the men of our group rode the Walt Disney World Railroad!) Then, that evening, we had an 8:40PM ADR for Cinderella’s Royal Table. When I first got the reservation, I thought it would be a bummer because of being so late, but little did I know that we would still be inside the Castle when it was time for Wishes! We were able to see out the windows to see the fireworks, it was so magical, it was incredible! You can read more about our Disney Magic over at My Dreams of Disney! Favorite Memory #3, October 1, 2011 — Celebrating the 40th Anniversary of Walt Disney World! October 1, 2011: A Disney Day to beat all days! The 40th Anniversary of the Magic Kingdom was one born out of Disney Magic, both in Florida and North Carolina! Our trip wouldn’t have been even possible if Friday, September 30 hadn’t been a teacher workday. That allowed me to schedule a special trip with just a little cost. We stayed at Pop Century, we pulled Sophie out of school half a day early, and with my niece Stephanie in tow, we traveled to Florida! Taking in the start of the Food and Wine Festival was incredible, but the real treat was on Saturday, when we woke to a pristine Florida October day, clear skies, incredible atmosphere, and the Pixie Dust flowing non-stop! I’ll never forget about that day, which you can read about over at My Dreams of Disney! In 2008, we were over at the World Showcase walking through the Morocco Pavilion. As we rounded the corner, who should we see but Princess Jasmine and the Genie! Better yet, there was NO LINE to see them. Sophie had been talking all vacation that the only souvenir that she wanted was a Jasmine costume that she could wear for Halloween. So to round the corner and see Princess Jasmine with no line to wait in was a truly memorable occasion. Sophie was able to spend about 10 minutes talking with Princess Jasmine and the Genie, and we were able to grab that memorable photo to remember the visit by. 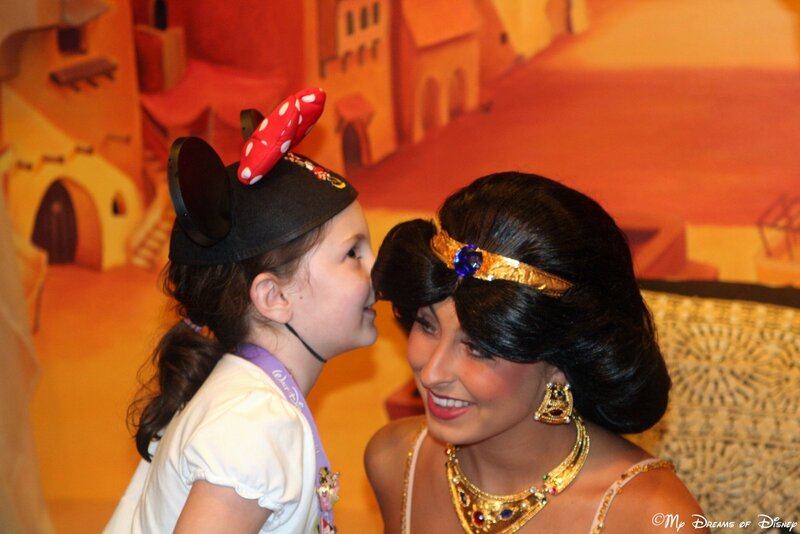 In the photo, Sophie is whispering to Princess Jasmine that she is going to be getting her costume later on in the trip! Our first trip to Disney World where we stayed at a Disney resort was in August, 2007, when we stayed at Coronado Springs for the first time. During that trip, we spent one day at the Animal Kingdom, and it was a day that had evening EMH. It was during those extra magic hours that we got to enjoy the block party over in Dinoland, U.S.A. Sophie had so much fun with the characters that were there! There was Goofy, being his normal Goofy self. 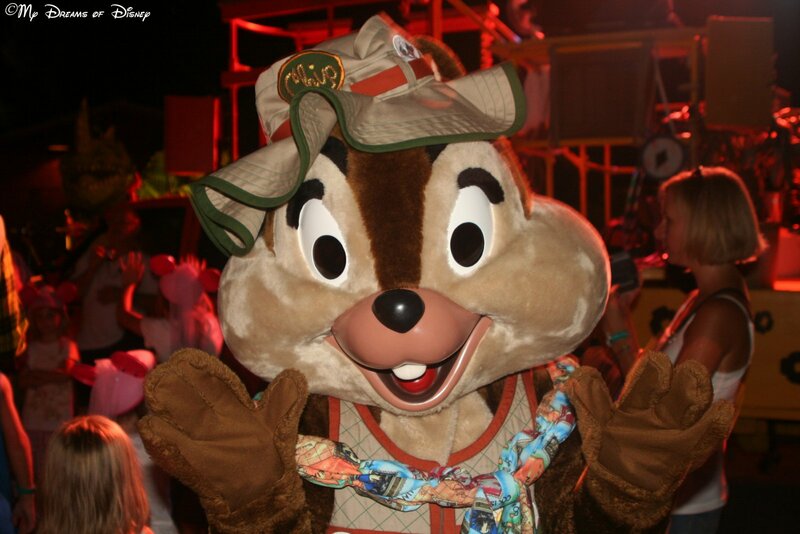 There were Chip & Dale, making all sorts of mischief. And there was Sophie, putting herself right in the middle of the party, along with all the other kids and their families that were there. The block party produced some good photos, but these are the best, I think. One of my primary reasons for starting My Dreams of Disney was so that I could keep all of the memories I have of our trips to Disney available for anyone that wanted to read them, and also so that I wouldn’t forget them myself. I hope you have enjoyed my trip down memory lane, as I remember my favorite Disney memories! Is Taking a Baby to Disney WORTH it? Thank God for Rainbows at Walt Disney World! Great post, Mike! I love reading about your wonderful Disney memories! Watching Wishes from INSIDE the castle had to be really something magical!